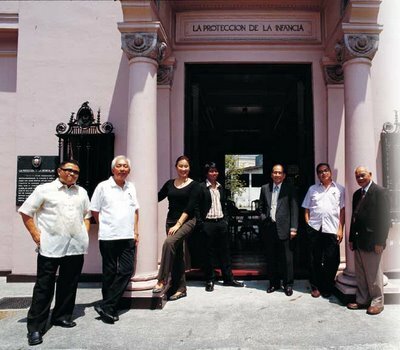 The Heritage Conservation Society Board of Trustees 2006-2007 (from left to right): Ivan Anthony S. Henares, Architect Augusto F. Villalon, Gemma Cruz-Araneta (President), Architect Melvin G. Patawaran, Ambassador Raul Goco, Architect Rene Luis S. Mata (Treasurer) and Atty. Magdaleno Cortez (Corporate Secretary). Not in the photo are former DepEd Undersecretary Juan Miguel Luz (Vice-President) and Urban Planner Nathaniel von Einsiedel.